Try as I may, I can’t recall when and where I learned to drink Manhattan’s. I know it wasn’t from my parents. They drank gin martini’s – always with extra olives, which they gave to my sisters, who were too young to drink. What I do know is that I was still in my very early 20s, when I abandoned the Manhattan in favor of the Perfect Manhattan. The crossover came at Scandia, the late, great Sunset Strip restaurant where I made so many memories as a bachelor. One night I ordered a Manhattan before dinner. The waiter asked if I ever had a Perfect Manhattan. He insisted that I try one. He brought it to me on the rocks in a cocktail glass instead of in the traditional Manhattan glass. WOW. What a difference. One sip and I was sold. He became my regular waiter at Scandia from that night on. That was some 50 years ago and I haven’t had a plain old Manhattan since. Somewhere during the 1970s designer drinks started to nudge the more old school cocktails out of favor. 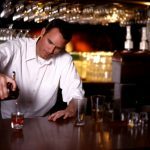 As a new generation of barkeeps evolved over the next 20 years, things like appletinis and chocolate martinis began to appear. Manhattans all but vanished and Perfect Manhattans became a lost treasure. More and more often, I would order a Perfect Manhattan and have to send it back with instructions on how to make one. On occasion I would see a bartender take out a book to look up instructions on how to make the drink and then serve up a regular Manhattan. One night it was served to me with cranberry juice in it. On a trip through England, Scotland and Wales a few years back, we stayed at some pretty posh country houses and castles. Before dinner each night we would repair to the sitting room for a drink. 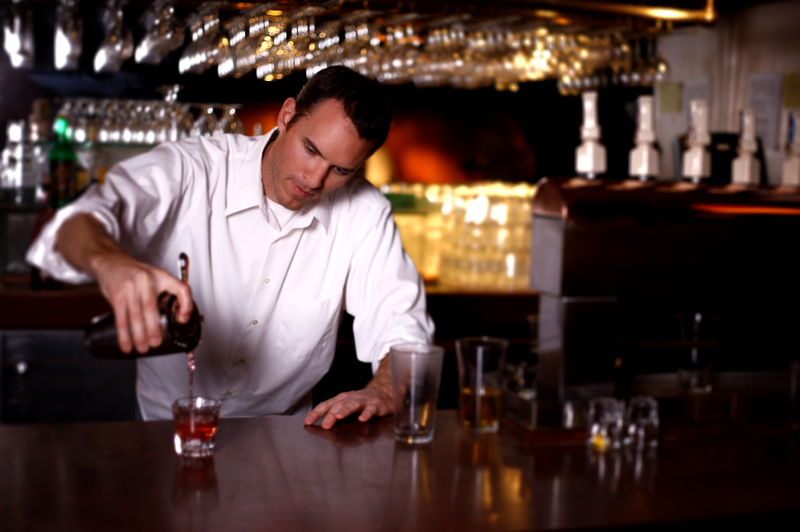 At each stop I would have to teach the bartender how to make a Perfect Manhattan. It may be anecdotal, but I think Manhattans are on the rebound these days. I seem to see increasing numbers of them being served and I’m meeting people who let it be known that a Manhattan is their drink of choice. I have taken it on as my personal responsibility to introduce these neophytes to the wonders of the Perfect Manhattan and I have gained unanimous agreement that it’s a better drink, not just some pretentious affectation. One friend even bought a bottle of rye whiskey for the Perfect Manhattans he makes at home. And that brings us to the heart of the matter – what is the difference between a Manhattan and a Perfect Manhattan? It’s in the vermouth. A regular Manhattan is made with sweet vermouth; a Perfect Manhattan is made with one-half part sweet vermouth and one-half part dry vermouth. A regular Manhattan is served with a Maraschino cherry; a Perfect Manhattan comes with a twist of lemon peel and no cherry. A perfect Manhattan also contains a dash of Angostura bitters, which often is left out of a regular Manhattan. Then there’s the matter of the whiskey. Use the wrong stuff and you can mess up even a Perfect Manhattan. Order a Manhattan or a Perfect Manhattan on the east coast and you’ll probably get it with rye whiskey. Only the top bars on the left coast stocked rye whiskey back in the 1950s and 1960s. Over time, rye whiskey vanished completely in the west. After some trial and error, I turned to Canadian Club as an acceptable substitute. She brought the drink to the table and before putting it down she turned away and said, “I forgot the bitters.” Impressive, I thought, she knows what she’s doing. She went back to the bar, added the bitters and brought the drink back to our table. WOW. Another transforming moment. Gone forever is CC. Now, if they have no rye whiskey I ask for my Perfect Manhattan with Makers Mark. I wish I could go back to everyone I’ve ever told to use CC over the years and tell them of this new revelation. Perhaps a few of them will read about it here. Then they, and you, will carry the word far and wide: order a Perfect Manhattan, not just a Manhattan; have it on the rocks, not neat in a Manhattan glass; ask for rye whiskey and if they don’t have any, go for Maker’s Mark. And for one brief, shining moment there’ll be Camelot. Wonderful march down the Manhattan road. I also acquired the Manhattan taste, but during the late 70’s in a moment of clarity and the urging of my father-in-law, acquired a summer-time taste for Tequila Gold Manhattans (w/sweet Vermouth and cherry juice). This warm weather treat is addictive, but not quite up to the standards of a Perfect Manhattan at Scandia, Chasen’s or the Brown Derby..
I’ll join you in this taste test – two Perfect Manhattans side-by-side, one with Rye and one with Makers Mark. Until I do that, I can’t be sure about which I prefer. I know that’s disloyal to my east coast roots. But Makers Mark Perfects are awfully good.